The last time Emory’s swimming and diving teams lost the University Athletic Association (UAA) Championships, Bill Clinton was president, Google was merely an idea and Seinfeld was still airing new episodes. With the opportunity to stretch their streak of titles to 20, Emory’s men’s and women’s teams each delivered at the Feb. 14-17 UAA Championships. The women dominated with 2049 team points, well ahead of No. 2 New York University’s (NYU) 1246 points. 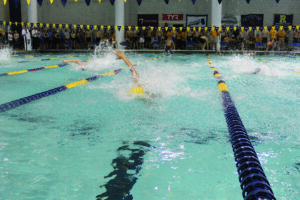 The men’s competition was a tighter race, with Emory’s 1725 points giving them a 206 point victory over second place NYU. 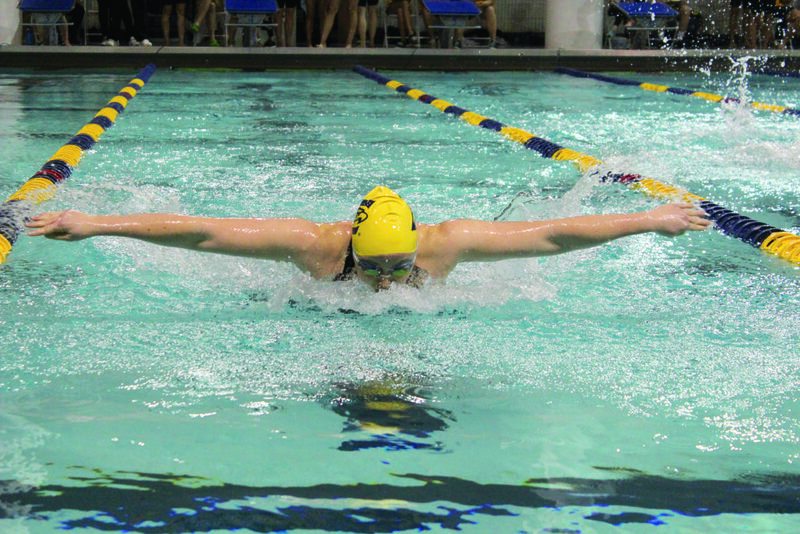 Emory welcomed seven UAA rivals into the WoodPEC as hosts of the 31st annual UAA Swimming and Diving Championships. That hospitality did not extend into the pool, as Emory came prepared to take care of business. The week began with the one-meter diving competition, in which Emory freshman Katie Kushner provided the best result of any Emory diver at UAA’s. Her score of 450.2 points was good for second place in the event. She also finished No. 8 in the three-meter. Though the men’s team didn’t have any divers at the meet, they were well prepared to make up the points in the swimming events. A key contributor to that effort was junior Tom Gordon, who dominated the distance freestyle events. His first-place finishes in the 200-yard freestyle (1:39.34), 500-yard freestyle (4:28.65) and mile (15:34.65) were good enough to earn him the men’s UAA Swimmer of the Year award. 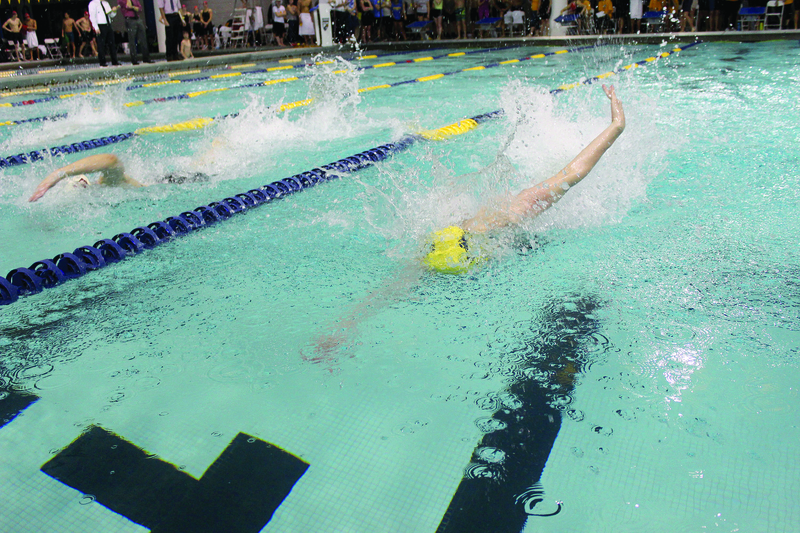 Gordon also anchored Emory’s champion 800-yard freestyle relay team, which was led by junior Alex Kohlman and followed by junior Matt Rogers and freshman Kellen Stillman. The women’s UAA Swimmer of the Year award also went to an Emory swimmer, senior Cindy Cheng, who earned the award for the third consecutive season. She is the third woman in UAA history to accomplish the feat, according to Emory Athletics. Cheng left no stone unturned in her final UAA Championship meet, touching first in the 500-yard freestyle with a time of 4:47.94 and sweeping the backstroke events, going 54.16 in the 100 and 1:57.87 in the 200. She set UAA records in all three races. She also contributed to victories in the 200-yard and 400-yard medley relays and the 400-yard and 800-yard freestyle relays. 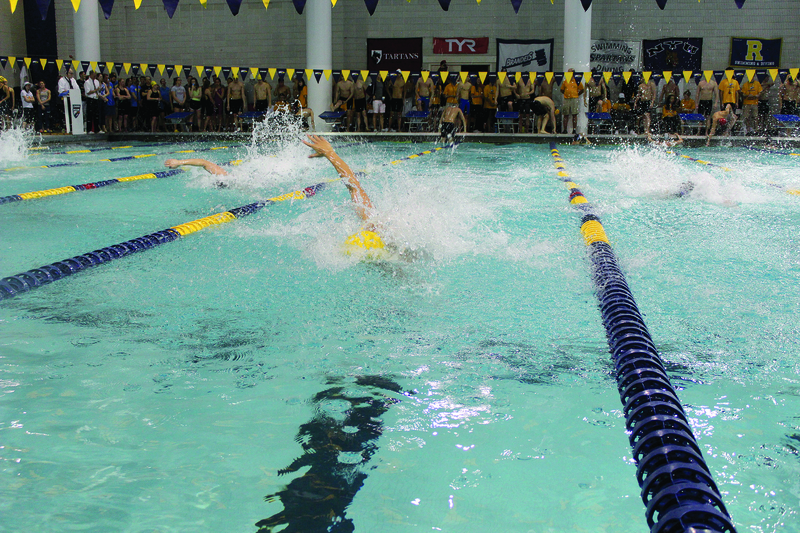 For both teams, the freestyle events were largely an Emory heyday. In the 50-yard freestyle, junior Fiona Muir claimed first with a time of 23.05, good enough to break her own UAA record of 23.12, followed closely behind by junior Meg Taylor at 23.38. The 100-yard freestyle may have been the greatest stunner, with Muir and Taylor going one-two yet again, followed by seniors Ming Ong, Julia Wawer and sophomore Caroline Olson, giving the Emory women a first through fifth place sweep in the event. That dominance also showed in the freestyle relay events, with the Emory men and women reaching the top of the podium in each of the 200-yard, 400-yard (another UAA record) and 800-yard freestyle relay events. Senior Oliver Smith swam his final UAA Championship meet in great form, winning the 50-yard freestyle in a time of 19.93, the 100-yard freestyle with a time of 44.53 (a UAA record), and second in the 100-yard butterfly, just 14 hundredths of a second behind Washington University in St. Louis’ junior Andrew Pek. Likewise, senior Rebecca Upton closed out her final chapter in the UAA with an incredible, albeit exhausting, performance. On Thursday, Upton finished No. 3 in the 500-yard freestyle behind teammates Cheng and Turcanu, then swam both the mile and the 200 butterfly on Saturday. She finished second in the mile behind teammate junior Julia Durmer before she claimed victory in the 200-yard fly with a time of 2:03.06. Upton’s results speak to another facet of this meet: Emory athletes often find themselves battling one another for the top spot in their events. Other strong finishers included sophomore Sage Ono, who won the 100-yard backstroke, and junior Ashley Daniels, who touched first in the 100-yard breaststroke and second in the 200-yard. On the men’s side, Cooper Tollen finished No. 3 in the 200-yard breaststroke. With two decades of consecutive UAA titles to consider, the meet results were a celebration of both the current team’s accomplishments as well as the accomplishments of the many Emory athletes that came before them. On top of the team’s other successes, the Emory coaching staff composed of Howell and assistant coaches Bobby Hackett, Cindy Fontana, Chris Marshall and John Petroff earned Men’s and Women’s Coaching Staff of the Year honors at the conclusion of the weekend. Emory swim will suit up again for a last-chance qualification meet, the Queen’s Invitational, in Charlotte, N.C., Feb. 23-24. The 2018 Region II Diving Championships will take place March 2 and 3 in San Antonio, Texas, before the season’s conclusion at the 2018 NCAA DIII National Championships in Indianapolis, Ind., March 23-24, when the Eagles will try to defend their 2017 titles. Editorials Page Editor Madeline Lutwyche is on Emory women’s diving team.